“This is going to kill your children” – Jamie Oliver is making a point about cooking junk food for your kids. The quote and screenshot above is from Jamie Oliver’s Food Revolution. What I find interesting in the show is not so much the garbage that we eat these days, as much as the amazing amount of resistance to any change when a stranger tries to approach us about something we have been doing all our lives (watch more here: Jamie Oliver’s Food Revolution Episode 1 Part 3). When the outsider is your enemy, when someone tries to take you out of your comfort zone, resistance is the easier path to take, no mater how deep in a hole you are. How do you deal with resistance from others or yourself? 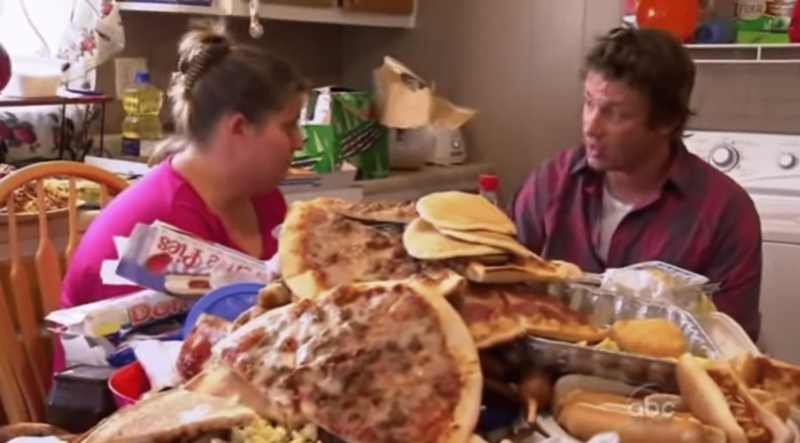 Jamie Oliver uses shock, gathering together all the garbage food this family is eating in a week. Sarah Bush tries to cut through her doubts and just finish what she started. Even if the result is bad, finishing empowers you to do even more. When you’ve proven yourself to complete what you started, everything further just seems simpler. This entry was posted on Friday, December 25th, 2015 at 5:42 am	and is filed under Productivity.